Why it is a good idea to buy pedigree puppy? Supposing you want to get a puppy beagle as a pet rather that a show dog, we can only recommend you to buy a pedigree puppy. A beagle as a family companion is not the same as a second hand car or faulty goods you can buy on sale. Your pet should be well bodied, healthy and lively just like any other top quality dog bred for showing. The dog should be of the proper height, with a beautiful head with a devoted face and an irresistible look and at the same time reliable and trustworthy with children and other people. Your pet’s pedigree is the only guarantee for you to know who the parents of your puppy are. You can have all the information not only about the parents but also about two generations of the grandparents. Since all breeding dogs are dogs without any exterior faults, it is a guarantee that your pet has all the makings of a true beagle. Good breeders treat all puppies in the litter equally. In order to look after puppies properly, they must be well fed, wormed three times and vaccinated three times. All puppies in the litter have their pedigree and it is the judges’ job to decide whether they are suitable for breeding. 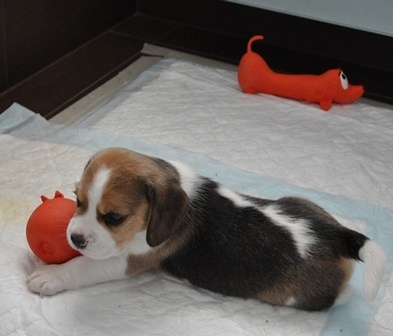 The best way to find a quality beagle puppy is to find a breeder of a good reputation. We would always recommend it not only when looking for a show dog but also when looking for a family pet. Breeder beginners, offering puppies at very low prices, do not seem trustworthy to have given their puppies all the necessary attention and maximum care. They do not have enough knowledge and experience to give you advice on how to feed your puppy, how to look after it and how to train it. When choosing a puppy, do not consider just the fact whether you like the puppy but also whether the puppy looks healthy and clean. Your puppy should have bright clean eyes, clean ears, without any signs of irritation. The look in its eyes should be a sign of a well balanced nature and intelligence. The fur should be soft and shiny. Also, check the animal’s teeth. Spend some time observing the way the puppy moves. It should be moving healthily and decisively, without being too shy and fearful. Buying a puppy is not just doing business, it is a moment when choosing a family member for the next 12 years. Our dogs and puppies are a member of our family. We offer them lots of our spare time, comfort and hospitality in our home. We do the best to help them and take care of puppies to grow up happily.